There's been a rise, both abundant and significant, of progressive rock and metal from Poland in the last decade. Notable bands include the mighty Riverside and it's spin off Lunatic Soul, but also Satellite, Division by Zero, Strawberry Fields, and Tesserakt to name a few more. 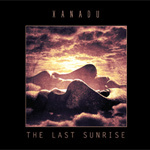 Now welcome newcomers Xanadu and their debut album, The Last Sunrise on ProgRock Records. Without seeking comparisons, you can't help but notice the influences of Xanadu, from Pink Floyd to their comrades, Riverside. The music of The Last Sunrise, however, is notably melancholy, sometimes dark. Often heavy riffage and arrangements are colored throughout by wistful, ethereal, and sometimes spooky synth layers. If there are 'lighter' moments or uplifting segments they come only in brevity and are swept up quickly by the heaviness and atmosphere. You'll hear this early in Miles Away or in the piano accompaniment early in Dark Shadows. Sometimes those synth layers are given more room and become ambitious as within Miles Away or the later Vicious Circle. While musicianship and composition is strong, they are at a premium on the two longest tracks. Violent Dream Part 1, an instrumental, is the first, allowing for well-planned movements and integration of every instrument, excepting the vocals. Thanks to that last feature it's the best track on the album. That's not say that Michal Jarski is poor vocalist; just not that compelling. That is until you hear him on the second best, and last track, The Last Sunrise. He's smooth and effective, but also a minimal player. Again as with Violent Dream, the combination of instruments and a diverse arrangement drives the song to its heights. For a debut, The Last Sunrise is a ambitious and entertaining first start for Xanadu. Considering the ground swell of creativity from Poland's progressive music community, we can expect continued success from this band. Recommended. For a debut, The Last Sunrise is a ambitious and entertaining first start for Xanadu. Considering the ground swell of creativity from Poland's progressive music community, we can expect continued success from this band.